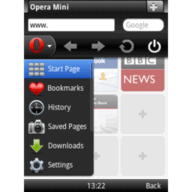 Opera Mini enables you to take your full Web experience to your mobile phone. Stay in touch with your friends on Facebook, search with Google, get your e-mail on the go, do your online banking. 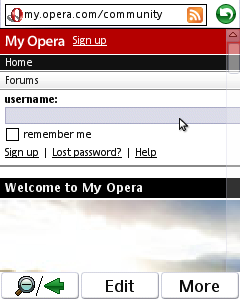 There are no limits - Opera Mini is the quick, easy and secure way to get any Web page you want. 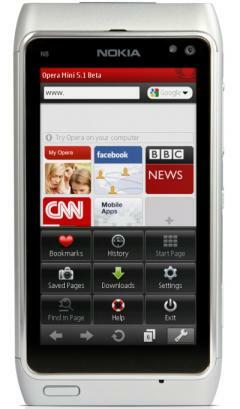 Opera Mini is now available as a native version for Symbian. This means improvements in loading time (overall) and a flawless integration with your phone! • Faster start up time. • Even faster page loading. • Integration with your your phone native input. • Improved performance, especially for older S60 devices. • Device integration for cut-and-paste, email client and more. • No more dialogue boxes asking permission to connect to the Web. · Input mode indicator is back on 2nd edition devices. · Correct default font for CJK installations. · Better hardware keyboard support on touch devices. · Full screen keyboard is now used for RTL text input on Symbian^3/Anna. · Improved support for Nokia X7-00 device. · Stability fixes and minor improvements. · Improved scrolling, panning and zooming. · True pinch-to-zoom on devices that support pinch. · The new version features a share button, so you can easily post, Tweet (twiddly-diddly-deet), or just shout it out loud on Facebook, vKontakte or My Opera.